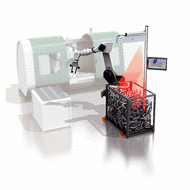 Robot guidance using 3D vision systems designed for object localization is making a vital contribution to the optimization of industrial manufacturing processes. Robot guidance systems from SICK give users an easy, economical way to benefit from this sophisticated technology. The systems stand out thanks to their reliable, user-friendly design. They can be integrated without difficulty in existing environments, deliver high-precision measurement results and consequently play a key role in making part handling more versatile than ever before.